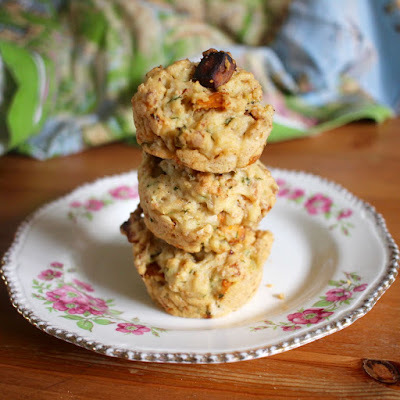 I mentioned in my last post (about more savoury muffins) that I was struggling to find time to make these muffins. Finally it seemed a crime to let my roasted sweet potato and tofu feta go rancid rather than star in these muffins. So I made them between dinner and Sylvia's bed time. And ate them for breakfast, lunch and dinner the next day. If only there has been some leftover for supper! It wasn't easy fitting them in. I was busy with Sylvia, outside playing with her hula hoops, chatting to neighbours, and inspecting her scars from a fall at school. Luckily they weren't too difficult to mix up and pop in the oven. I just needed to take a couple of breaks from reading The Midnight Gang by David Walliams with Sylvia. And then they were out in the oven wafting their tempting aromas through the kitchen. The muffins were everything I had hoped. Well almost. They are not the bonniest muffins. I discovered the hard way that the shape when they are spooned into muffins tins is the shape they keep. (Would a little more liquid help smooth them out or make them soggy?) But they were slightly crisp outside and soft inside. I loved the pairing of sweet potato and sauerkraut. The tofu feta added nice flavour and texture (more chewy than creamy). I am really delighted to discover how good the sauerkraut is in the muffins. It adds a certain umami. They were easy to eat. 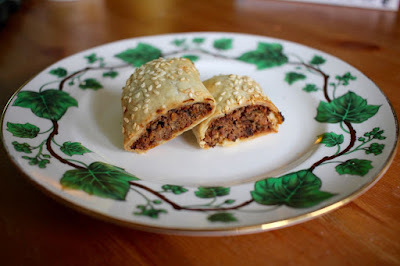 A great portable snack and lovely with stew and rice for dinner. The only challenge left was photographing them. I arrived home, after riding into a headwind, and took some hasty photos before E arrived home with Sylvia from after school care. I had to be content to put the camera away as we rushed about to serve dinner. And decide how to divvy up the last few muffins. 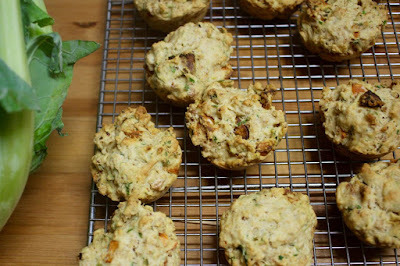 I am sending these muffins to the No Waste Food Challenge at Elizabeth's Kitchen Diary. Mix dry ingredients in a medium large mixing bowl. Toss through the sweet potato, feta, sauerkraut and parsley. Gently stir in the water and oil. Spoon into a greased 12 hole muffin pan and bake at 200 C for 25-30 minutes or until when you insert a skewer it comes out clean. Cool on a wire rack and store in an airtight container. I chopped 1 largish sweet potato into small cubes and roasted with a pinch of salt and a drizzle of oil until soft. My tofu feta was a crumbly mixture in a marinade so I squeezed out as much liquid as possible. It was quite like this tofu feta recipe. I was delighted with a batch of savoury muffins I made last week. I had hoped to make some more tonight but time got the better of me. Yet I mustn't grumble. It has been a productive weekend. I have rediscovered my delicious bookmarking account, I have painted the back door frame and planted some seedlings in my pots. I have even made a stew for tomorrow's dinner. 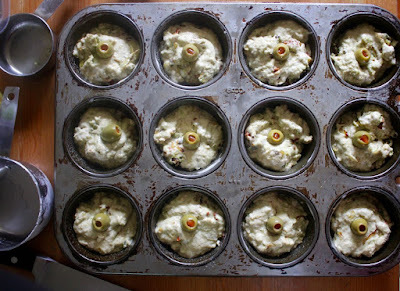 I just didn't have time to make another batch of muffins with tofu feta. I had a yen for savoury muffins. So I decided to search for muffin recipes using tofu feta. If you ask Google, it seems they are pretty thin on the ground. Finally I decided to adapt a vegan muffin recipe using sun-dried tomatoes and olives. My mum was visiting while I was making these muffins. She was gone by the time they came out of the oven. It had been raining so hard when she left that she had needed to roll up her trousers and take off her shoes to wade to the car. As soon as she reached the car the rain stopped. I think one of these muffins might have been just the thing for such a moment. Instead, E and I enjoyed some for lunch and more for dinner with soup. I was lucky to snaffle a muffin for the following day to take to work. I really loved these muffins, as did E. It was all we could do not to just inhale the whole batch the moment it came out of the oven. They were very soft and almost quiche-like. I assume this is due to the tofu in the feta. You could try this with almond feta but I suspect the texture would change. Though it would probably work. They had plenty of flavour and a nice texture. 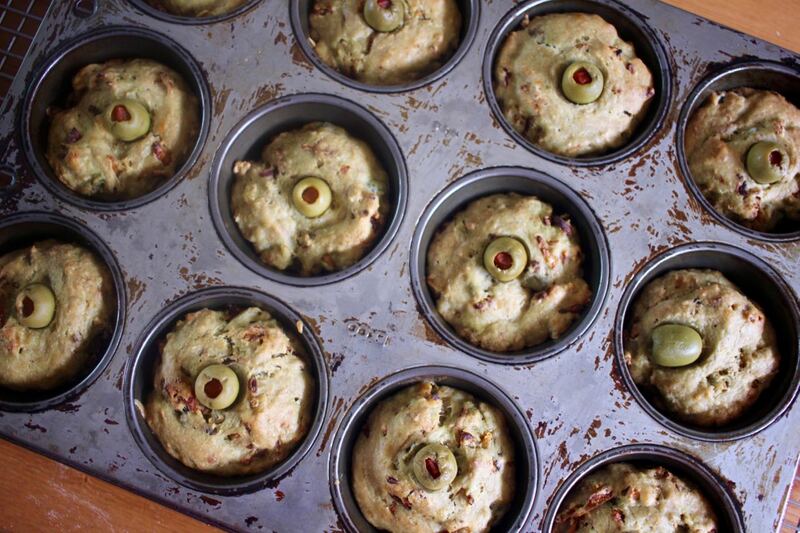 I also really liked how the stuffed olives on the top made the muffins look like one eyed aliens. I was so pleased with these muffins and happy to share them. I wish there were more savoury muffins in the world. Sweet muffins are great but they are treats. 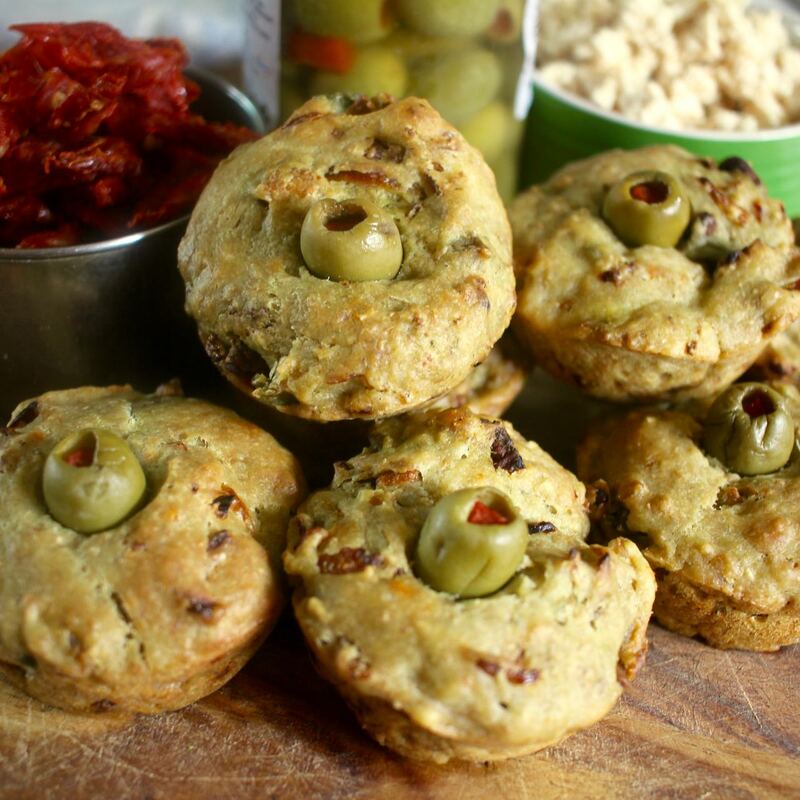 Savoury muffins can be part of a meal. They are great for lunch snacks, picnics and even breakfast. I also love to serve them with soup or as dinner on the run. I just wish I had the energy to make them more. I am sending these muffins to Kimmy and Mary Ellen for Healthy Vegan Fridays. Grease a 12 hole muffin pan and preheat oven to 200 C.
Make the add-ins. Cook onion in oil until starting to crisp up around the edges. This can be done while chopping tomatoes and olives. Once the onion is cooked, turn off the heat and stir in the tomatoes, olives tofu and pesto. Set aside to cool while making the muffin batter. 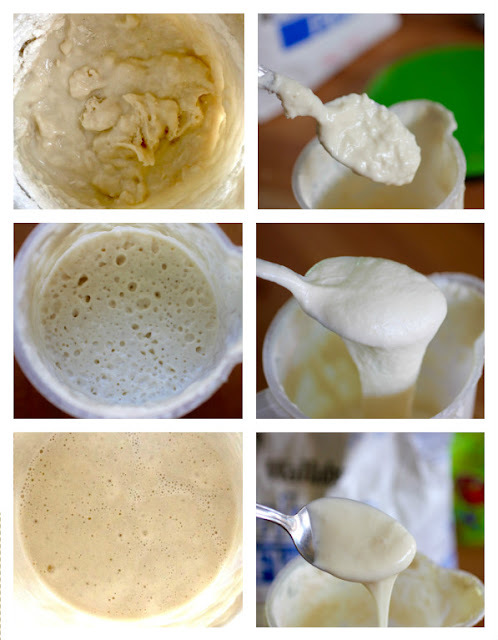 To make the muffin batter, mix together the dry ingredients in one bowl and wet ingredients in another. Pour wet into dry and mix gently until combined. Stir in add-ins. Spoon evenly into the 12 muffin holes. 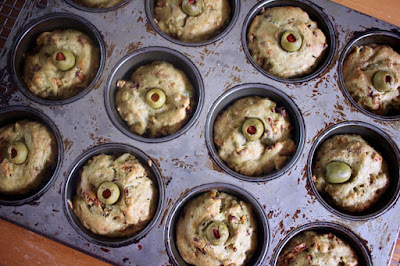 Push an olive into the middle of each muffin so it is still visible at the top. Bake for 20-30 minutes. Rest 5 minutes and then turn onto a wire rack to cool. Eat warm or room temperature. Keeps for a day or two in an airtight container. *NOTES: My tofu feta was a crumbly mixture in a marinade so I squeezed out as much liquid as possible. 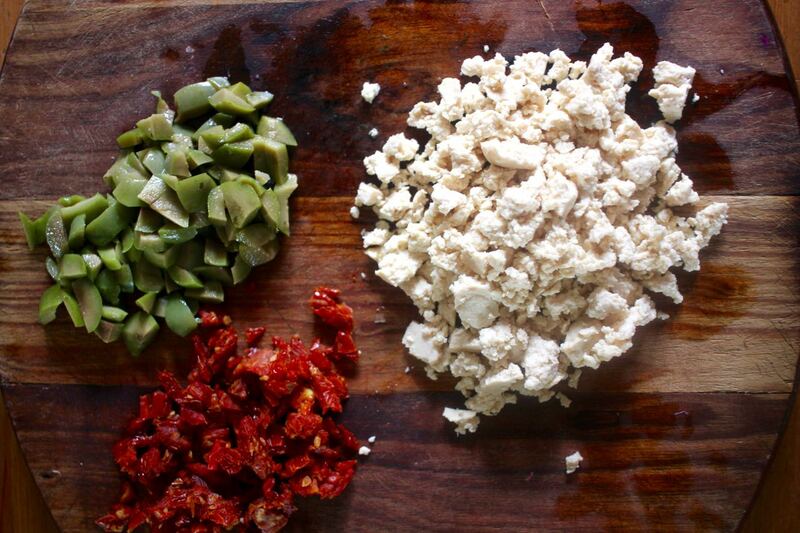 It was quite like this tofu feta recipe. I used oil-free semi dried tomatoes. 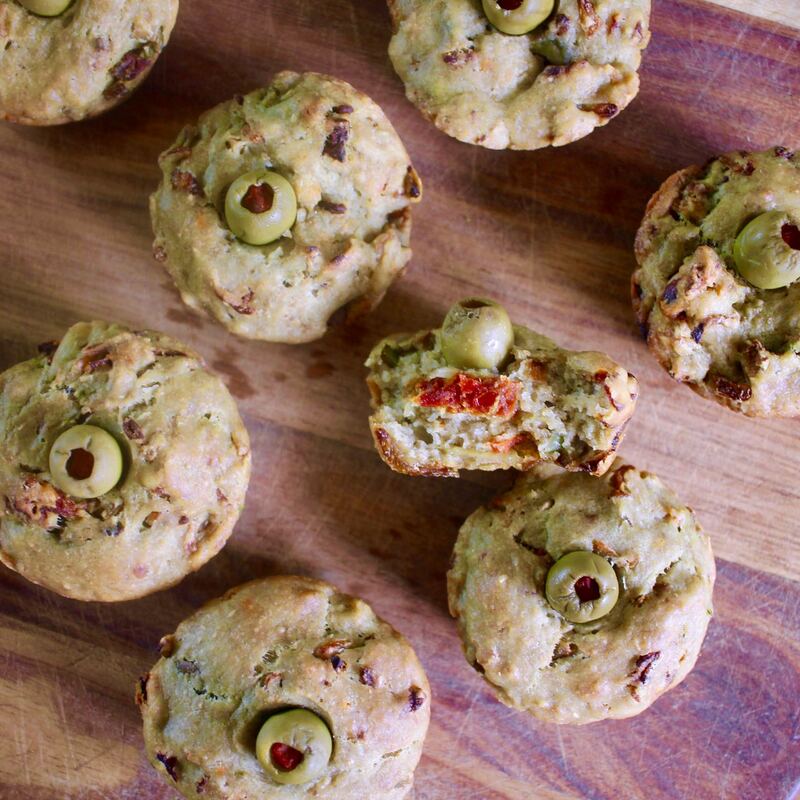 I used green olives marinated in lemon and garlic oil for in the muffins. However they had stones in them so I used pitted olives stuffed with pimentos on the top. If you want vegan muffins, make sure you use a vegan pesto. I used this pesto recipe. Feta is not a favourite cheese of mine but it does give some recipes a boost. I have experimented with a few vegan feta recipes and it is hard to replace. Some I have tried making have been too dry or the wrong texture. Last year I made vegan feta with raw almonds. I almost didn't post it because it didn't work in the salad I made it for. But it was very good as a spread and in sausage rolls. I was reminded of this almond feta when I tried a tofu feta recently and wished it was as good as this one. It is quite a soft spread. I think I preferred it to the baked almond feta, which was good, especially for crumbling, but could be a bit dry. This one was lovely on crackers and sandwiches but was a bit soft for mixing into a salad. One of the advantages of this recipe was that it is really simple. Just blend the ingredients. No faffing about with baking or resting or straining. It is the sort of recipe to make when you need feta now! I had grand visions of using the feta in this Quinoa, cashew and honeyed carrot salad. I had lots of lovely photos of the vegies from the farmers market. It didn't quite work so I have listed a few more recipes below that I would like to try the feta in, which I think might be more successful. The almond feta looks pretty on top of the salad. But when mixed through, the salad was just too clumpy. 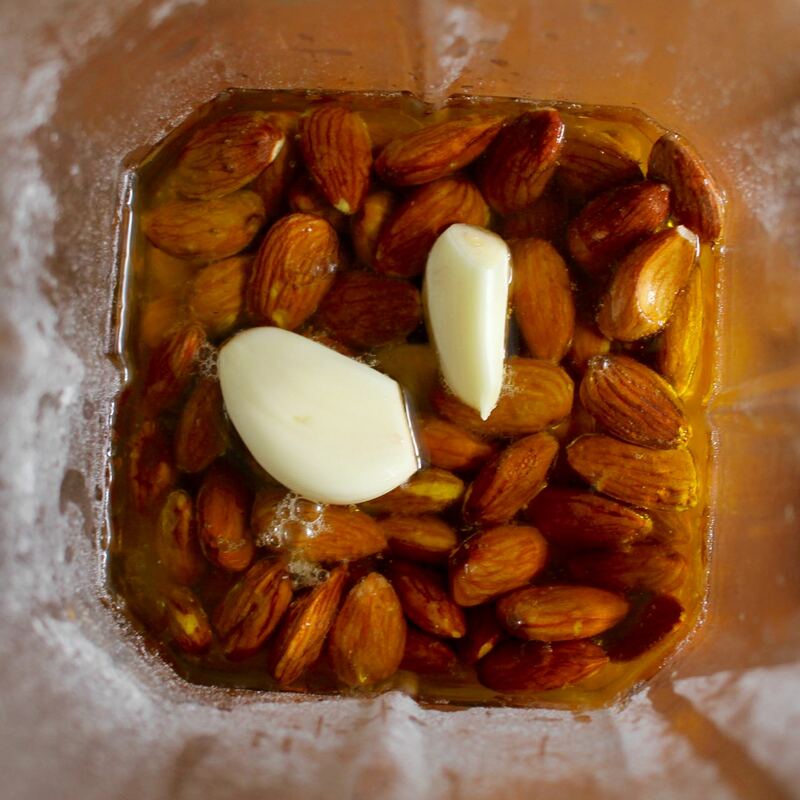 I have had a few almond feta dishes in cafes where the feta is served in a lot of oil. Maybe this would make a difference? More of the feta was enjoyed on crackers. But there was a lot of it. Meanwhile, I have had a bit more time for cooking this week but need more time to write up some of the dishes I made. And it is Harmony Week and I had just remembered we are meant to make something for afternoon tea tomorrow at school. I have made mashed potato at an unholy hour to use in making potato scones tomorrow morning! I am sending this to Kimmy and Mary Ellen for Healthy Vegan Fridays. Blend and scrape down a couple of time until smooth. I have had some busy weeks. This week will be my first for a few weeks not to be juggling a new job and an old job. Time in the kitchen has been limited and I have felt the need for some better meals. More vegies. Less carbs. I have been working my way through Kristy Turner's But I Could Never Go Vegan cookbook. The recipes are great and I will write more about the book one day. 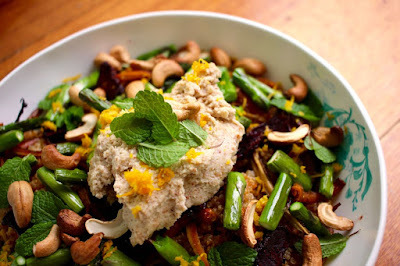 Today I wanted to share my version of a salad from the book. Salad so often get a bad rap. I wish there were more salads like this one in the world. 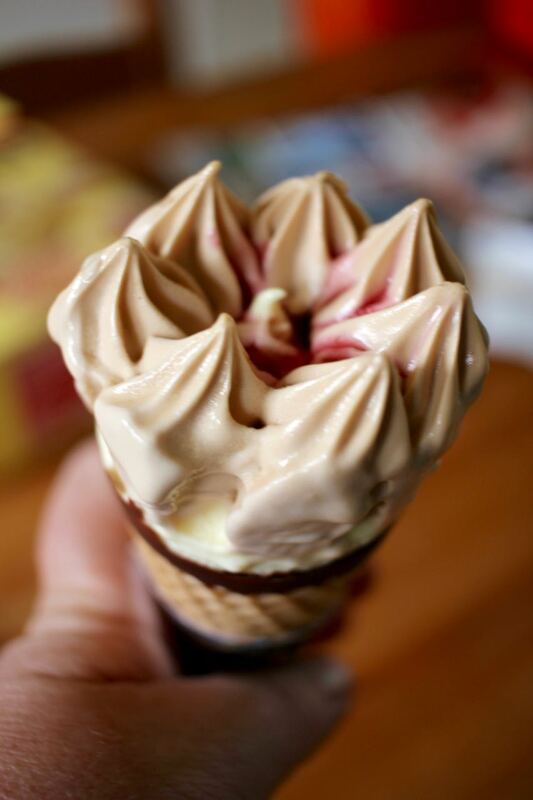 We had it on the weekend and it was such a delight. So much crunch and colour. 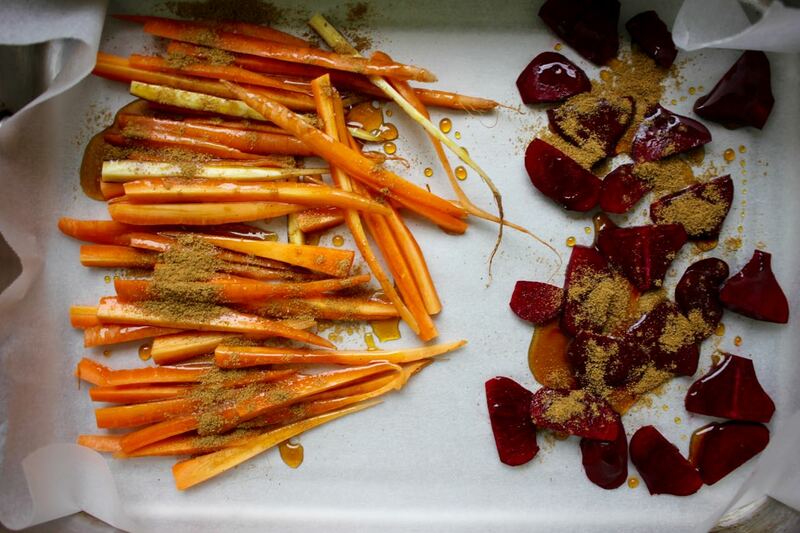 So sharp and sweet and savoury. All wrapped up in a creamy dressing. The tang of the dressing worked well with the noochy cheesiness of the broccoli. I also loved that this salad used up some bits and pieces that were in my kitchen. Best of all, it was so satisfying that I didn't need anything with it or after it. If only it was enough to give me all the energy I need right now! I am sending this salad to Lisa and Jac's No Croutons Required, to Meat Free Mondays and to Kimmy and Mary-Ellen for Healthy Vegan Fridays. To roast broccoli: Cut broccoli into small florets and thinly slice the stems. 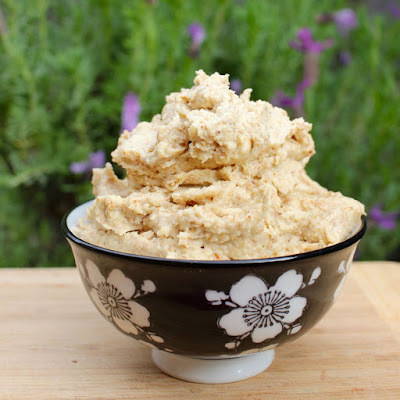 Toss with tamari, maple syrup and nutritional yeast flakes. Roast until softened and starting to crisp around the edges. I microwaved my florets for 1 minute and then roasted at 220 C for 30 minutes. The original recipe suggested 20 minutes at 200 C. Set aside to cool. 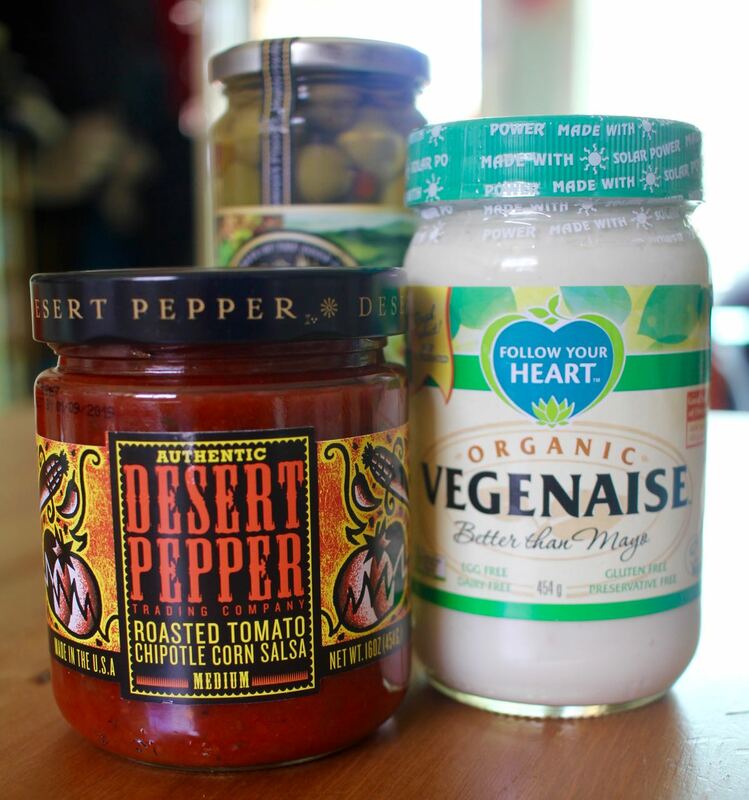 Make dressing by placing all ingredients in a small bowl and whisking or mixing with a fork until smooth and creamy. Make the salad by layering in the lettuce, cabbage, apple, celery, broccoli, cramberries and almonds. Drizzle with about half the dressing and toss. 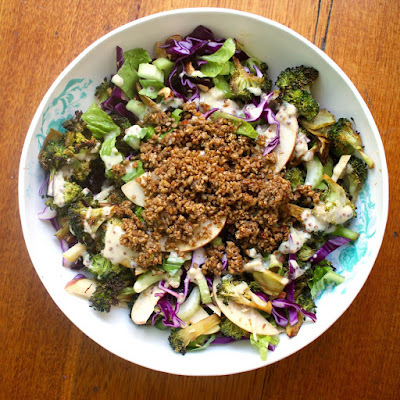 Serve topped with sausage crumbles and extra dressing on the side. I created my starter back in mid 2014. It was my first foray into sourdough and I was very nervous. I wrote a post about maintaining the starter back then. A few years on I am happy to report that it is still alive and producing lovely bread. Now I am more relaxed and am writing an update on starter maintenance from this perspective. 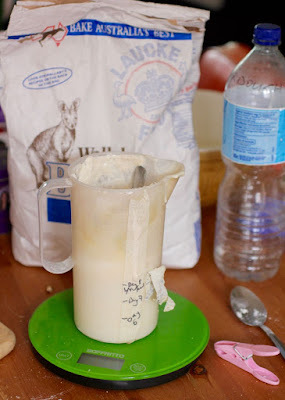 For those who are not familiar with maintaining a sourdough starter, one of the biggest challenges is using it regularly as it needs regular feeding to stay healthy and hence continues to grow. If you don't use it regularly you either have an unhealthy starter or need to throw some of it out. It was a scary prospect once I had made my starter and had to keep it alive. (Others also get a starter from a friend or buy it online.) However I have kept up the feeding it usually every week with some longer periods when I am busy. It usually lives in the fridge but will sit out at least 30 minutes after feeding. I keep it in a plastic jug that holds about 1.25 litres and I usually have about 500-750mls of starter. Unlike in my earlier post on starter maintenance, I now feed the starter based on need rather than a set amount but the weight of water always equals the weight of the flour. I have an idea of the amount I usually have the jug which helps me work out how much I need. If I use 300g of starter for bread, I feed 150g each of flour and water. If there is not much starter left, I feed it generously. And if I didn't use much starter, I don't feed it much. I still used water that has been boiled and cooled. I use electronic scales to weigh it but I know people who use equal amounts in cup measures and don't even own scales. 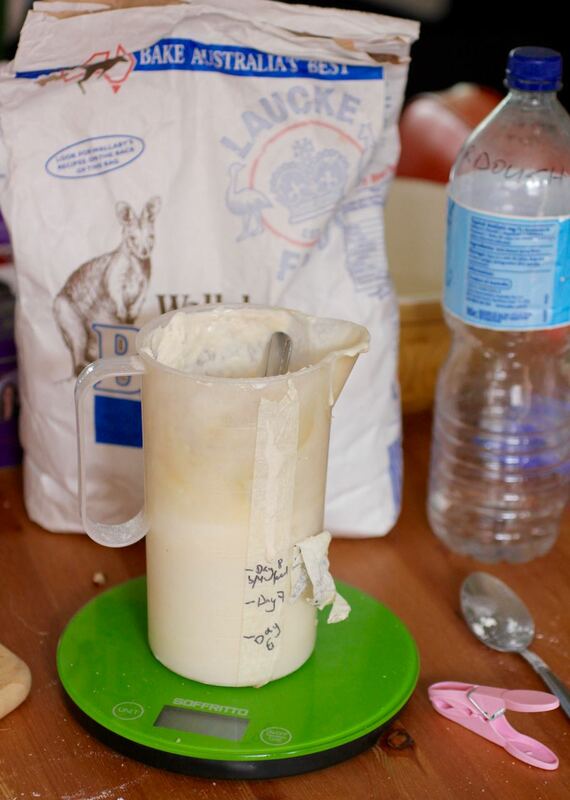 I usually buy Wallaby flour - a white plain flour that is made for bread-making. I keep a bottle of cooled boiled water that I keep topped up occasionally when the kettle has cooled. For baking bread I find tap water is fine but I use the cooled boiled water for feeding the starter to make sure it doesn't get impurities into it. I still follow the basic rules from my first post. 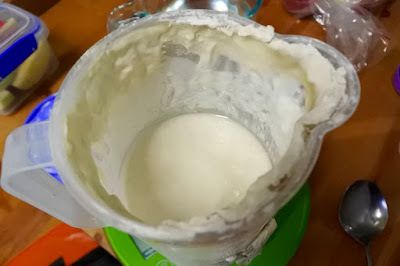 If the starter is warm, it needs more feeding, if the starter is cold it needs less feeding and if the starter smells unpleasantly sour it needs more feeding. I have got to know how it should smell and how it shouldn't, how it looks when healthy and when not so good. Just fed - when I feed the starter it is quite thick. I don't worry if it is a little lumpy. This can give the little wild yeasts more work to munch through the flour. Ready to use - the starter is best to use when it is thick and stretchy with lots of large bubbles. After a week in the fridge it is usually like this. You can also leave it on the bench overnight, depending on the weather, to get this texture. Hungry - when the starter gets thin and has clusters of tiny bubbles or is just a bit grey and watery on top. This is usually after it has been in the fridge for over a week and a half. The starter is hungry and desperate for a feed. When the starter has been neglected too long, I usually just stir in any water on top and feed it. The smell of the starter is a great way to check the health of the starter. 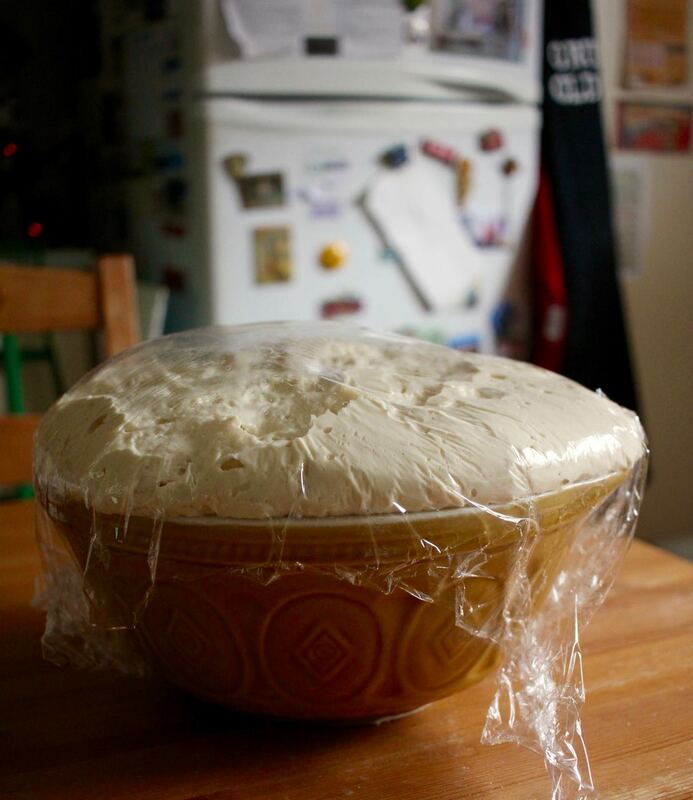 If it is ripe and yeasty then it is doing well. If starts to smell over-ripe and/or reminds you of nail polish remover, it needs some TLC. When I first made my starter I was so worried about killing it off. Yet it has been quite resilient. I have read that if your starter is poorly, it helps to reduce the starter to just a few tablespoons and feed it up. This seems to work fine. If it is not so great, my bread doesn't rise as well (see below photos of overnight sourdough bread dough) and the bread can taste a bit more sour but it still does us fine. So now I worry less when it gets out of shape. I know it doesn't take too much to help it back to good health. I keep my starter in the same plastic tub that I have had ever since I made it. The tub fits in my fridge door nicely and has a lid that is not too tight (important as the gases will build up in the tub). As you can see in the above photo, it gets pretty crusty around the top. Sometimes the crustiness builds up in the lid, making it hard to close it, so I need to dig out or break off crustiness. I sometimes wonder what this build up is like in the sourdoughs I hear of which are hundreds of years old. Having kept my starter alive for so long, especially during some busy periods, has only been possible by finding recipes that are quick to make and that we love to eat. So many sourdough recipes online are complex with lots of steps. 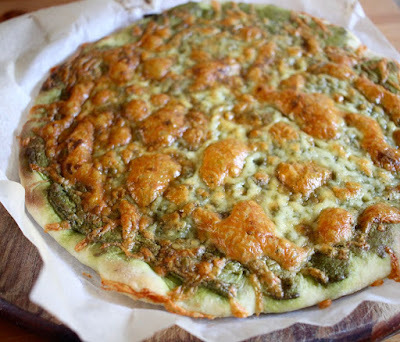 I have found recipes for bread, flatbreads and pizza dough that are straightforward and delicious. I talk about them below. Firstly I yet again am grateful to Celia for all her sourdough inspiration but particularly for her overnight sourdough bread recipe. This is my regular bread recipe now. It only requires a little planning and a little time the night before and then a bit of shaping and baking in the morning, given you have time to hang about while it rises and bakes for about 90-120 minutes. 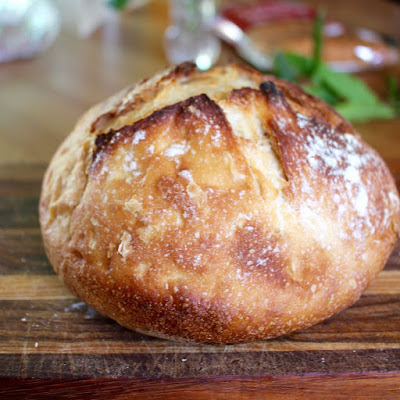 It is a great recipe that has kept me baking sourdough bread regular, even when busy. I have shared the two pictures of this bread dough to illustrate that the condition of the starter really does make a difference to the bread. 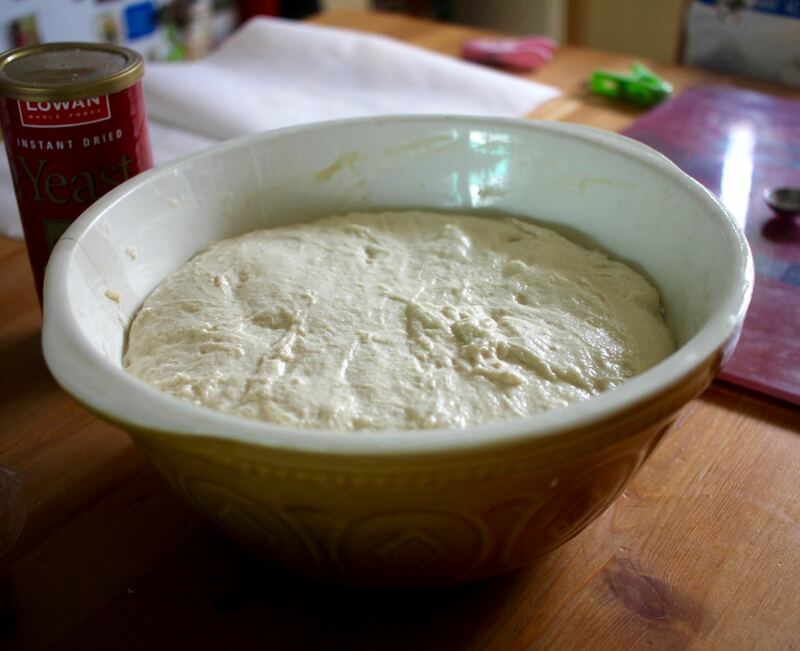 Both pictures are of the dough after sitting overnight. I am lazy sometimes and just take the starter cold from the fridge. It works much better when brought out of the fridge to sit at room temperature and get nicely bubbly. I have passed some starter to a few friends and my mum. Of these, only my mum still uses hers. She bakes bread every day or two. I wish I could say I bake so regularly but I don't have energy to do it. We still buy bread elsewhere as well. However I don't spend lots of money on fancy sourdoughs. I wish I could say I bake bread every week but that doesn't happen. I usually use sourdough every week or so. I use it enough that I don't need to just put some of the starter in the bin so I can feed it up. Two of my favourite quick recipes that make an easy dinner and mean almost instant sourdough products are flatbreads and pizza. I wrote about the flatbreads in my earlier starter maintenance post. They are pretty quick and taste delicious warm off the frypan. 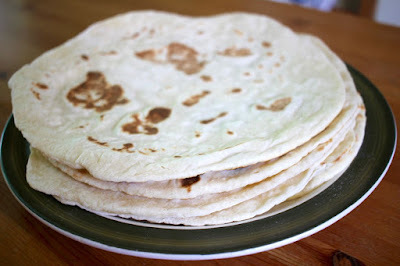 I have dabbled in sourdough tortillas but usually make these thicker flatbreads. I have had a couple of goes at baking a pizza on one of these flabreads. It worked well one one occasion but not on the other. My very favourite pizza base is my fast track sourdough pizza. While playing around with sourdough recipes, I found some that combine sourdough and commercial yeast. This is great for getting the flavour of sourdough and the speed of packaged yeast. I have adapted a pizza recipe to use my sourdough and it is on regular rotation in my house. I don't need to plans ahead for hours to make pizza for dinner. As well having hit upon some great easy sourdough recipes, I continue to experiment when I have the time and energy. Most of my breads are variations on the overnight sourdough bread. Occasionally I throw the sourdough starter into another recipe such as scones, batter for dipping tofu nuggets, and cakes. The more I do this, the more confident I become. So in summary, I buy a lot more flour these days because I bake bread far more with sourdough than I would without the prompt of the starter. The key to maintaining the starter is to feed it regularly and if you don't feed it as regularly as you would like, not to worry so much, but find some good easy recipes you can make with your starter. I leave you with some a list of recipes in which I have found sourdough works well. 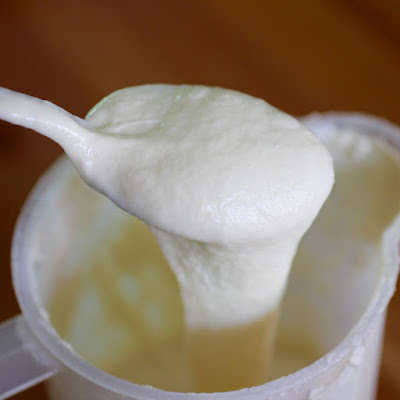 I would love to hear if you have a favourite way of using up sourdough starter. This year Sylvia had a hard time settling on a theme for her 8th birthday party. It seems parties have to have themes or be an outing these days. She finally chose Hedgehog Detective. Perfect for a girl who loves hedgehogs and enjoys spying on the neighbours with her friends. We had lots of fun planning "detective" (and spy) activities. 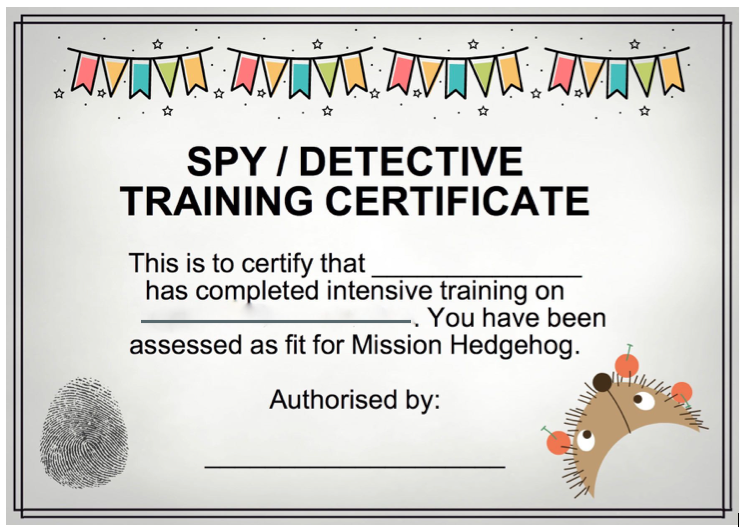 We made invitations to let Sylvia's school friends know that their mission was to undertake top secret training should they choose to accept it. I am aware of how grown up they are getting that they all read the invitations themselves. With a big smile. 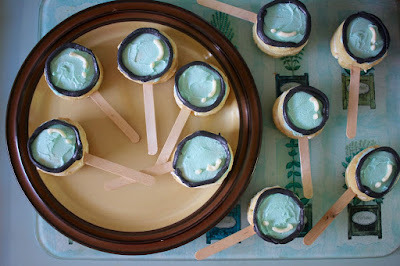 While trawling the web for party ideas, we found these magnifying glass cookies. Sylvia insisted we make them. I baked the biscuits using this recipe. However baking late at night can lead to mistakes. Like putting in 5 times as much milk. (It said 1/4 cup milk, not 1 and 1/4 cup milk.) I just took a part of the mixture and added flour until it was a smooth dough. They weren't as thin as I had hoped but were sturdy enough. We iced them with buttercream icing. It wasn't too difficult. I used a ziplock bag snipped at the end. At the last moment, I realised I did not have any black food colouring. Sylvia found some black chocolate colouring. In the bowl it looked dark grey but on the bikkies it looked black enough. The main problem was that we only did them on the morning of the party. Sylvia packaged them up for her friends in a cellophane bag with a ribbon. But the icing was still a bit soft and some got smudgy. Making them the day before would have helped. Though I am not sure if the buttercream icing is the best for setting hard. Our next challenge was the party bags (see top photo). Sylvia loves a party bag full of lollies but this year we kept the party bag sweet food to a minimum. Instead we agonised over when to hand it out. Finally we decided it was best to give one to each guest as they arrived. Partly because they could then wear their ID card for the whole party. I spent one afternoon scouring the $2 shops for fun stuff to put in the bags. I was pleased to find small magnifying glasses. 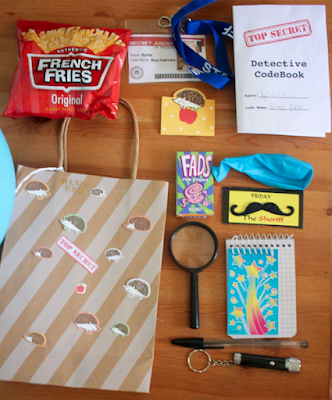 We also gave each kid an ID card, a fake mustache, a torch, a pen and notepad, a detective codebook, Fads and French Fries to eat, a balloon and a hedgehog thank you note from Sylvia. I felt a little politically incorrect giving out Fads (called Fags in my day because they look like a little box of cigarettes) but it seemed to fit the theme perfectly. As did the French Fries crisps. Making the ID cards was fun but not easy. 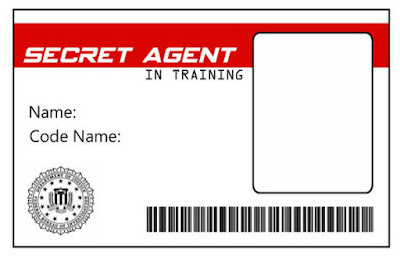 We used blank cards from this spy party printables. The hardest part was finding photos of each kid looking directly at the camera and not making a silly face. It should not be that hard but it was. I even ended up asking one parent to help me find a photo. Next we had to work out how to allocate spy names. I didn't want them choosing ones that would cause friction or too much hard work for the kid. (You picked my name, I don't like this name, I can't think of one etc etc) Finally we decided to name them after their month of their birthday and a colour. Such as Blue February and Red March. Always carry your ID card. Be prepared for danger at all times. Do not use your Agent name. Only use your Code name. Do not share your codes with anyone. Once they had all arrived and had fun with the party bags, we took them outside for hedgehog training. I had planned to hold all activities out on the grassy lawn. However it was quite hot on the day (28 C) so we had some activities under the carport. 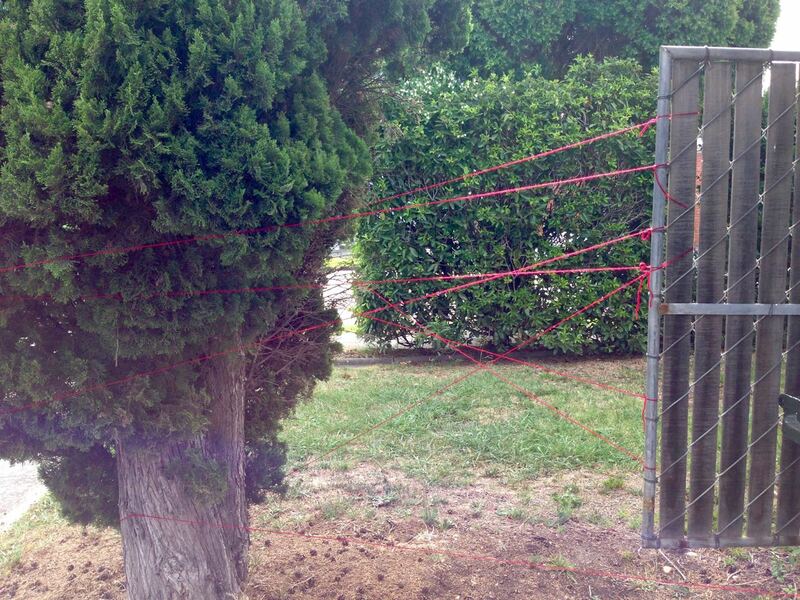 We still set up the red wool which was wrapped around a tree and tied to the side of a fence for the laser challenge. The kids had to climb through the red wool lasers. I had originally intended on buying red elastic but it was not easy to source and I had the ball of red wool which worked fine. I also loved the idea of the kids crawling under balloons hanging off a table. Perhaps it appealed because Sylvia loves balloons. And it was a silly kids version of spy training. You can just imagine Maxwell Smart doing this. 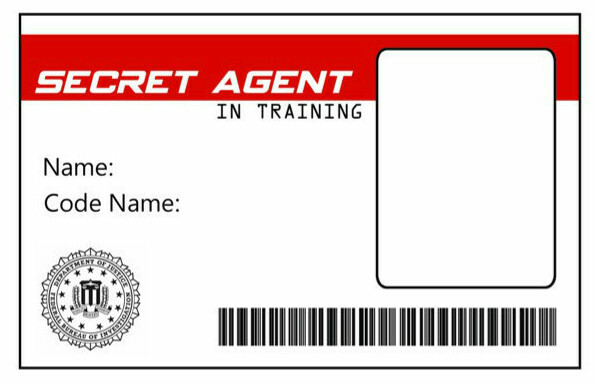 I was quite inspired by this Spy Training post. Then we had planned some activities. Sylvia and I had a lot of discussion about them. The main thing we agreed on were hoops. I had thought kids would jump or hop through. On the evening before I wrote up some training notes such as "5 high tuck jumps in case you need to look over a fence". However as there were 5 kids and 5 hoops they mostly played with their hoops but did a bit of the planned jumps. Then I had planned to present the kids with certificates. 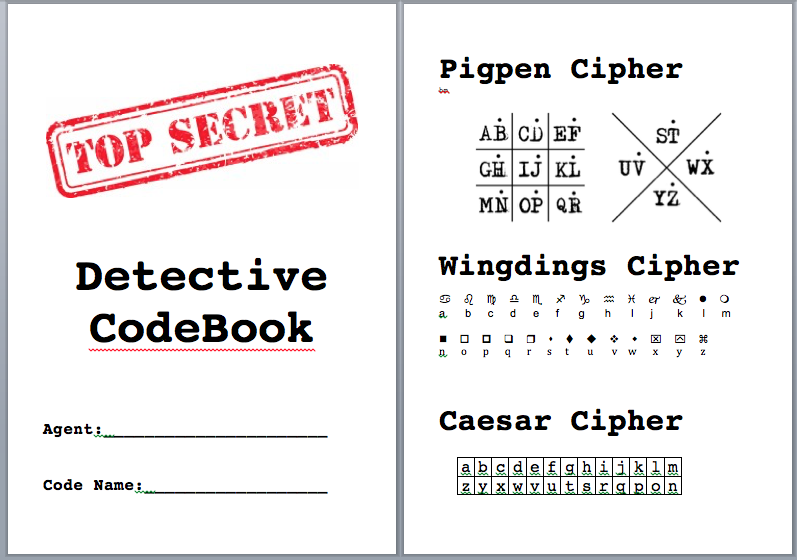 My mum ended up doing this while I supervised the hiding of the clues for crack the code. 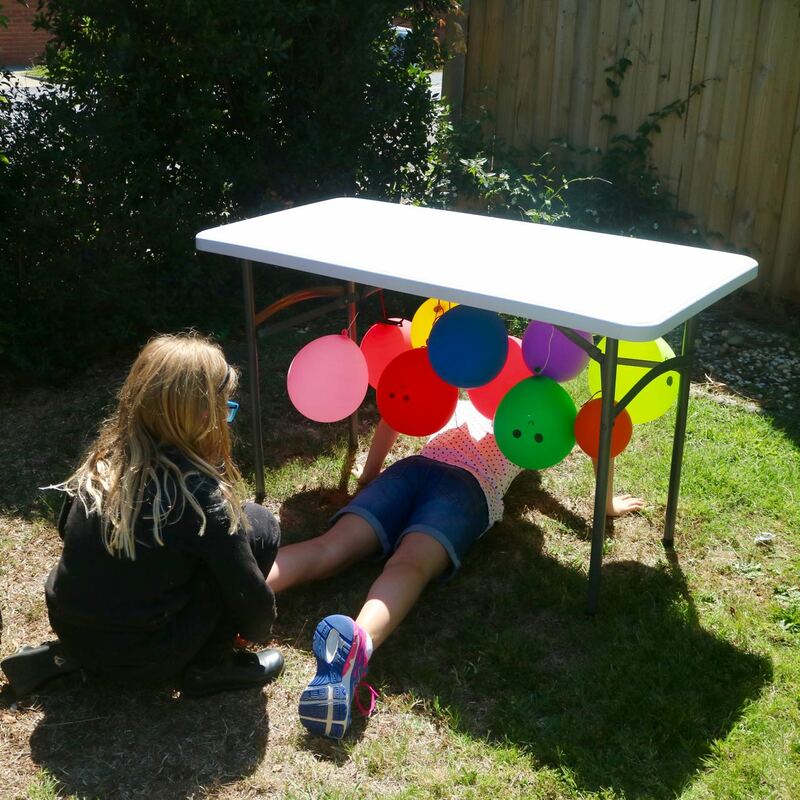 My nieces Quin and Maddy were assisting us with setting up the party (and very helpful) so they were given the task of hiding the clues with E. I had waited til the kids were outside so they didn't accidentally find a clue when inside. However hiding clues in code was extra challenging and had to be done 3 times before they got it right. Meanwhile we plied the party girls with water, grapes and the French fries crisps from their party bags. The kids had fun looking for the clues and we only had a couple of clues mixed up. It was quite interesting seeing how each child approached it. 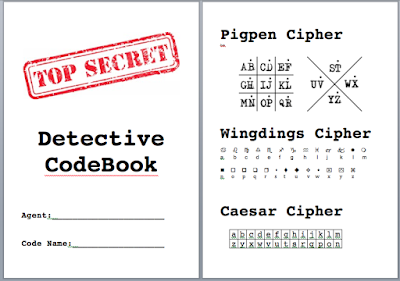 I helped explain the ciphers, which was challenging but they seemed to enjoy it. In fact, once the kids left the party, Sylvia suggested I do her more codes. Sadly, I was too busy collapsing to oblige. 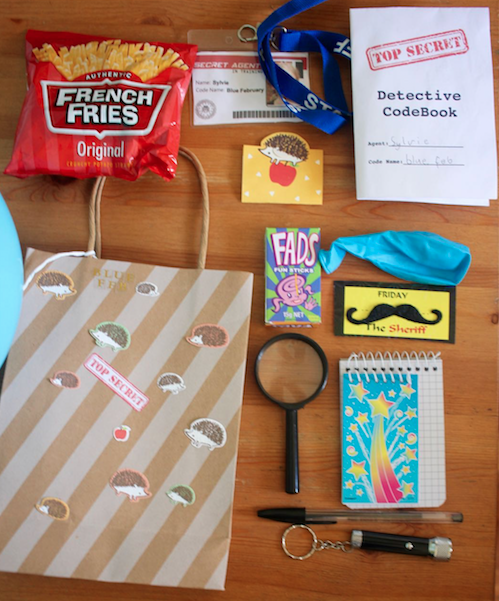 Everyone also loved their magnifying glass bikkie that we wrapped in cellophane and hid in the final spot of the clues game as the treasure. Then suddenly we were racing to get the kids to do the hedgehog birthday cake (which I wrote about separately) - singing, cutting, eating - before their parents arrived. I had meant to put out the surplus magnifying glass bikkies but forgot. I don't think they were that hungry by then. 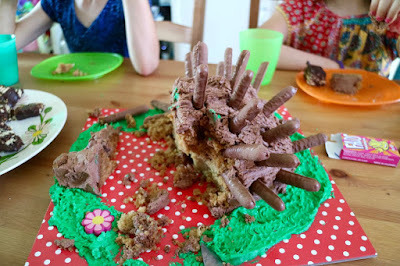 We also had some of my mum's delicious hedgehog slice (given that the official theme was Detective Hedgehog). Sylvia told me it was the best party. I was pleased that we weren't focusing on food this time (after parties with cupcake decorating and a pinata) and we managed to avoid pass the parcel. There was plenty of sugar in other birthday celebrations. On Sylvia's birthday she had pizza and chocolate pudding while we watched a video. The oven went out while baking the chocolate pudding so it took ages. 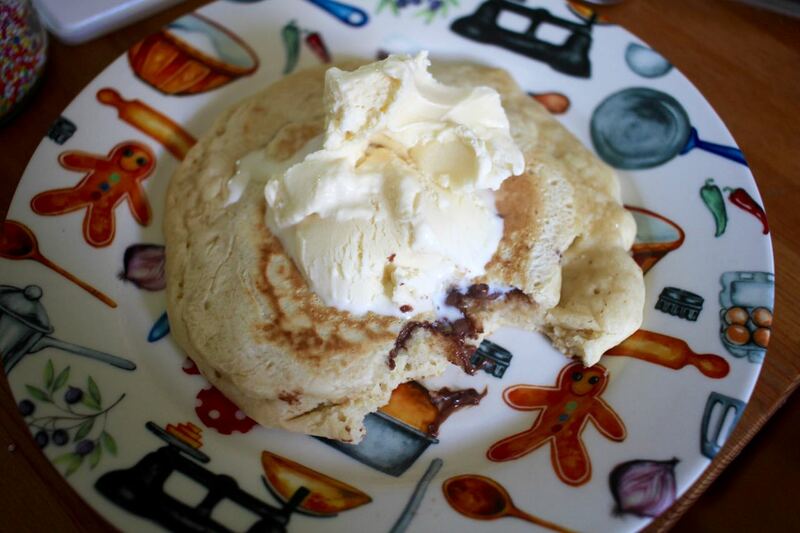 On the weekend after her birthday for a treat Sylvia had some nutella stuffed pancakes with ice cream and sprinkles. Meanwhile she took cupcakes to school for her birthday. I baked the chocolate cupcakes and she decorated them, making sure there were enough for each kid in her class and her friends who aren't in her class. It seems they went down well. Finally we also had a celebration down in Geelong with her cousins. The main activity was playing at the local pool with its children's water activity area. Then we went back to my parents' house where my mum had been baking. We had pavlova, cupcakes, a chocolate cake. I took along some more of the biscuits I had made - this time sandwiched together with nutella - and vegan sausage rolls. In true birthday fashion, my mum forgot she had also made yo yo biscuits so some came home with us. Sylvia helped decorate the cupcakes with her younger cousins. After all that, I am glad Sylvia's birthday season is over. It is lots of fun but quite tiring. I am a little sad and a little relieved that these children's parties wont last forever. 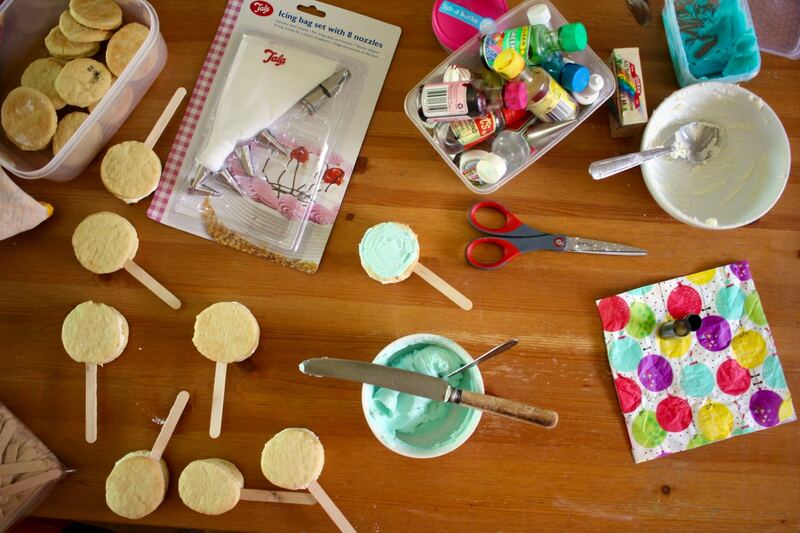 It is interesting to see Sylvia having her own thoughts on decorating cupcakes and party activities. I expect she will be organising her own parties soon. Sylvia decided her party this year would be a Detective Hedgehog party. It is a minimally easier theme than her earlier suggestion of a Gothic Diary party. I spent an afternoon with a friend looking at every shop in a shopping centre for hedgehog products and there were none. 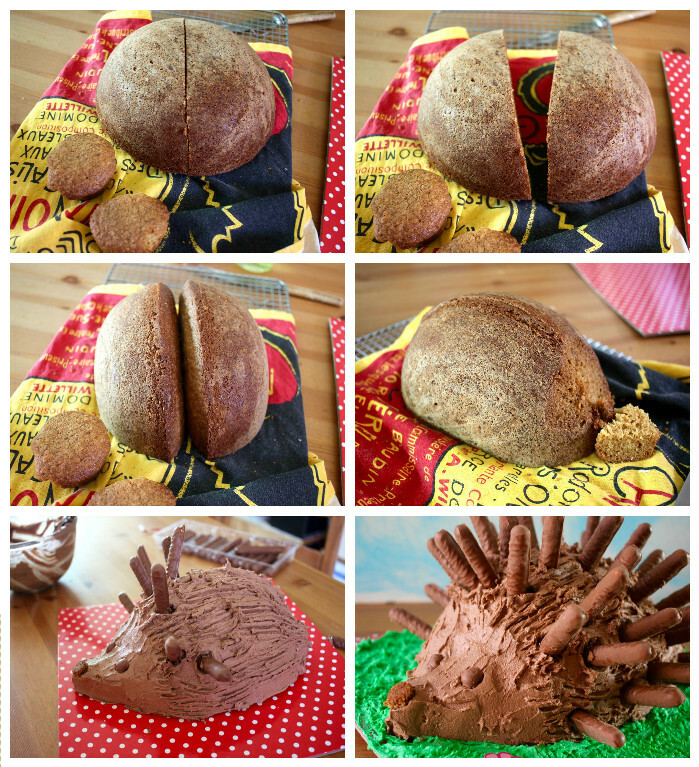 So I just held a party with detective activities and hedgehog cake. The cake was not too hard to make. I worried it would not come out of the pyrex bowl I used but it was fine. 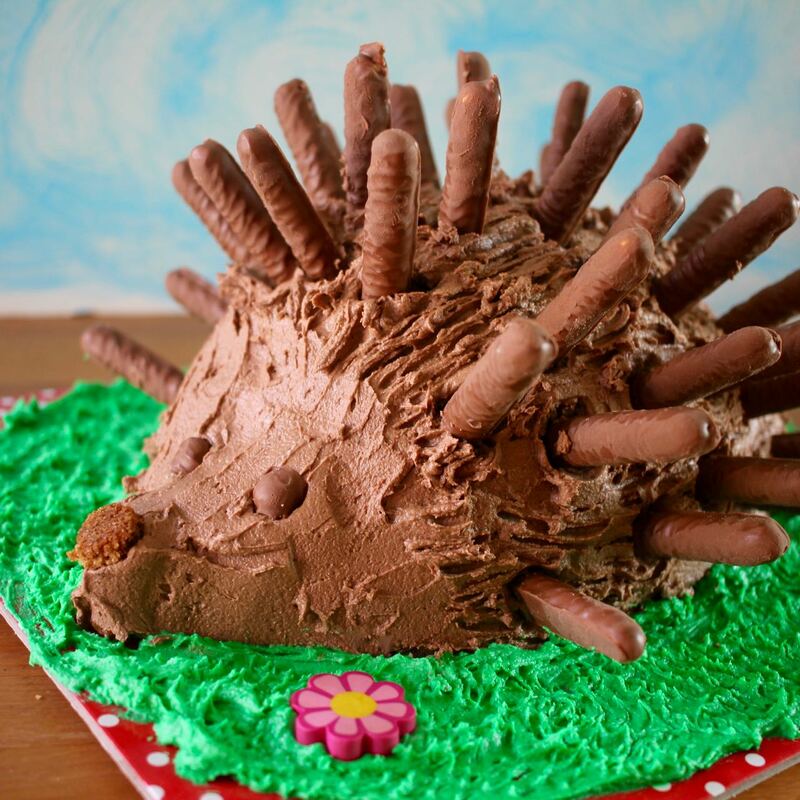 Sylvia was adamant that she wanted a vanilla sponge cake and chocolate fingers spikes. So I did as requested. I should have bought proper Cadbury's chocolate fingers. The supermarket only had the supermarket's own brand and they weren't as nice. But I didn't have time to scour the supermarkets nearby. I found a recipe using chocolate fingers and when it come to looking at this site while making the cake, the domain name registration had expired. Anyway how hard could sticking a few sticks in a cake be! Well as I stuck the last one in the backside, the two halves of the cake split. Oops. I did a quick patch up job with icing and the fork. It actually was harder to stick in chocolate fingers than I expected. Firstly they melted if held too long and the hide of the cake was tougher than I expected. Probably because I had to bake it for almost twice as long in the mixing bowl as the original recipe in the cake tin. I found it easiest to stick two sticks in from each side to have enough balance to avoid one pushing the cake off the board. I still think pretzels would be better spikes (and easier to be vegan). The kids loved the cake. Though as my mum commented, they would have been just as happy with a cardboard box covered in icing and chocolate fingers. I was most surprised at how much they loved the green icing grass around it. I only did this because I had some green icing that I had had for a few weeks and was sick of it being in the fridge. I am sending this cake to Tin and Thyme for We Should Cocoa. 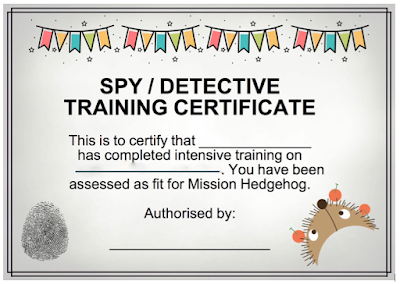 You can read more about the detective hedgehog games and food. To bake the sponge cake batter, grease and flour a largish round pyrex bowl. 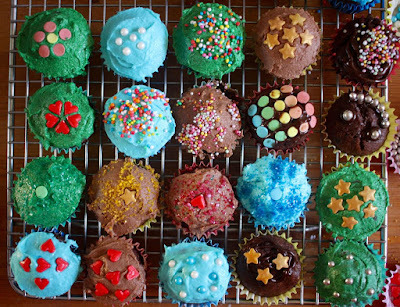 Set aside a little mixture to bake two or three muffins. Bake until cake is cooked. The muffins took about 30 minutes and the large cake took a lot longer than flatter cakes but I didn't note the time (perhaps 1.5 hours). I covered it with foil once it was golden brown so it didn't get too dark. Once a skewer inserted comes out clean, remove from oven and sit for about 5-10 minutes. Use a knife to loosen from the sides and turn out to cool. 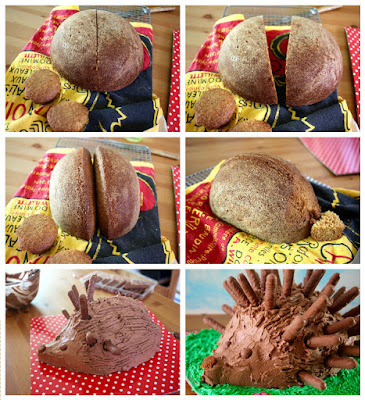 When ready to shape the hedgehog, trim the flat bottom of the cake if it is not really flat. Cut cake in half from top to bottom. Place each piece cut side down. Push the two flat bottom sides of the cake together to make a higher dome than you originally had. (See photo collage above for guidance.) This is the time to put it on a cake board. You can use jam or some icing to sandwich together the halves. Put a muffin at one end and shape the muffin into a snout. Trim to make sure muffin sits flush against the dome. You might also need to shape (trim) the front of the dome so it slopes towards the muffin snout. Now spread the buttercream all over the cake, using the buttercream to help shape the snout. Take a fork and, leaving a little semi circle at the front where the face will be, rake through the buttercream to make it bristly. To make the face we trimmed a piece of discarded muffin into a round nose and cut two of the chocolate sticks really short and arranged these as eyes and a nose. Poke the chocolate fingers into the cake in a circle across the front where the fork marks bristles mark the end of the face. Keep make rows of chocolate finger spikes until you reach the back. This was slightly tricky as I had to work fast so the chocolate did not melt at my touch. The cake baked so long that the outer cake was quite tough to poke a chocolate finger through. I made a few holes with a little knife - wonder if a chopstick would help. The other problem was that I had to push so hard that it threatened to push the cake off the board so I found that if I did two at a time, one chocolate stick from each side, it had the resistance I needed. I also had to avoid the join between the two halves of the cake which would split the cake in half. NB I am sure other spicks such as pretzels or chocolate sticks would work instead of chocolate fingers. If you wish, you can spread some green icing and little flowers around the hedgehog for the woodland look. If so, it is best to do this before the chocolate fingers go in. March brings us into autumn with all its mellow fruits and harvest bounty. Our kitchen hasn't seen lots of new recipe lately. 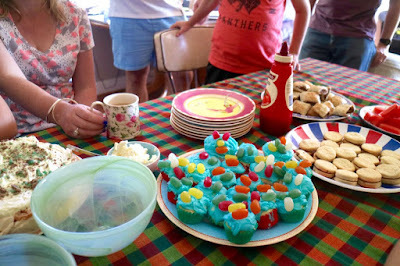 We have had too much else on with settling into Term 1 of school, celebrating birthdays, and a change of job. However we are still eating well and enjoying a few favourites. The above meal is typical of my kitchen lately. 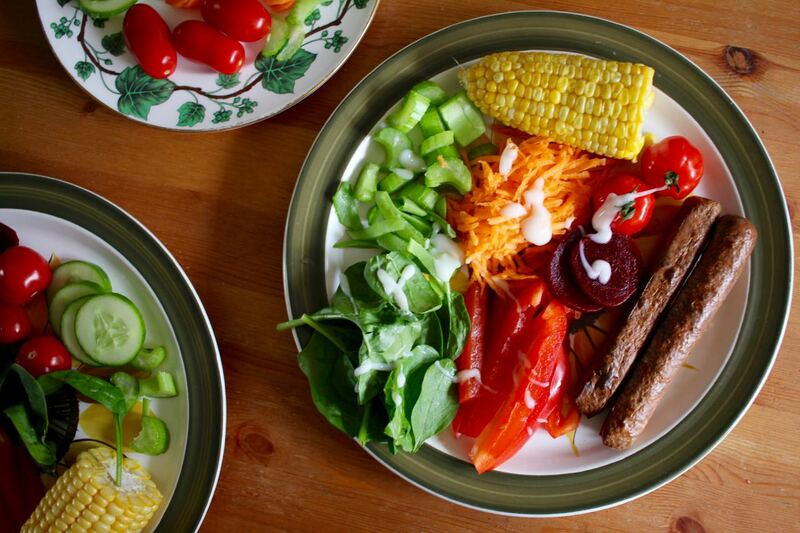 Vegetarian sausages, lots of vegies and some salad cream. Easy and quick. 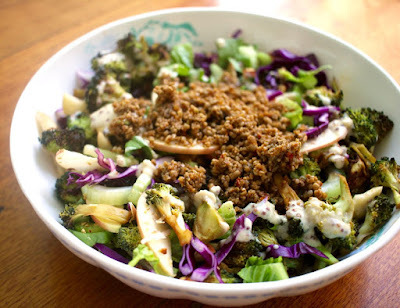 I really love the bowl food concept (also sometimes call buddah bowls or nourish bowls). Whether I am putting together some easy protein or some leftover stew, I find it easier to chop lots of colourful vegies rather than fiddle about with a side dish or salad. We had a trip to the pool recently and I promised Sylvia an ice cream afterwards. 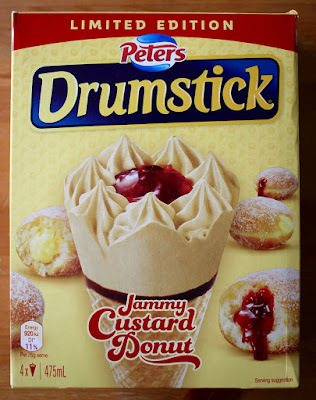 She chose this box of Jammy Custard Donut Drumsticks. This is how it looked. 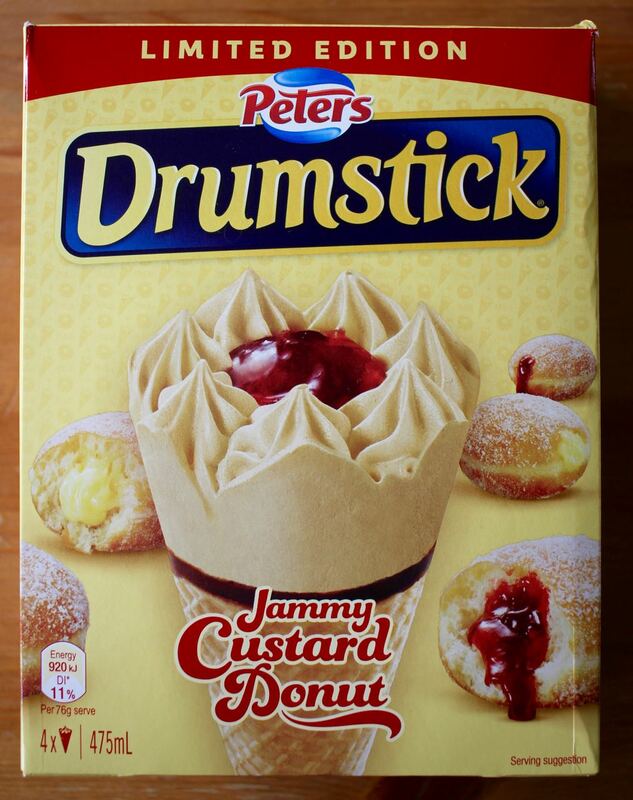 I want to know what happened to that glistening blob of jam on top. Sylvia didn't even like it. She was not keen on the chunks of doughnut dough in it. I liked it but had really wanted her to choose the Golden Gaytime one with butterscotch swirls. This meal was based on a Sesame Kale Glow Bowl. I didn't have tempeh so I used firm tofu instead. 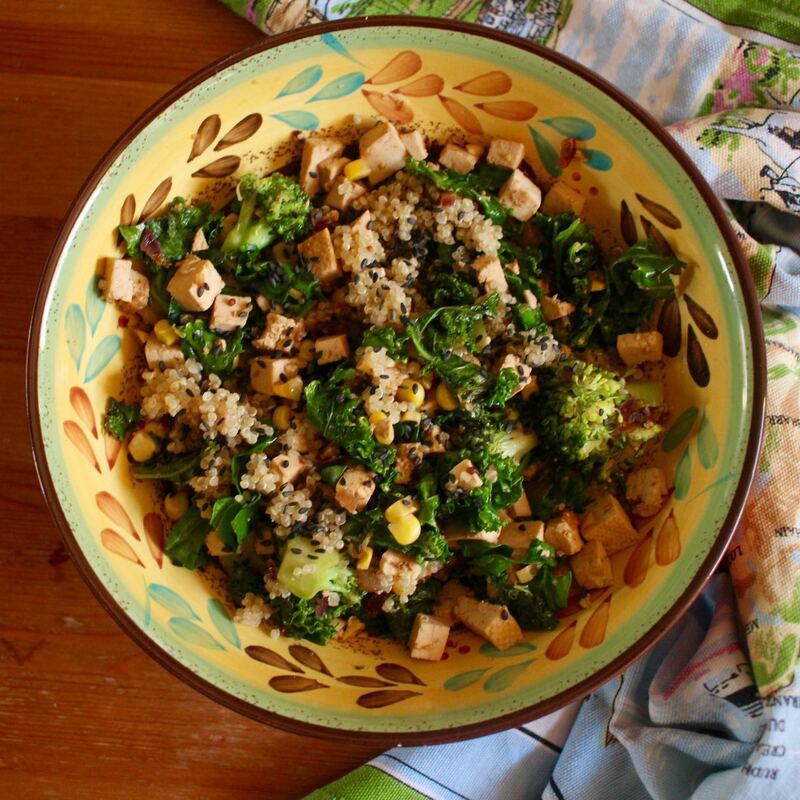 It was a nice meal with lots of greens, tofu and Asian dressing on quinoa, but I would be interested to try it with tempeh. 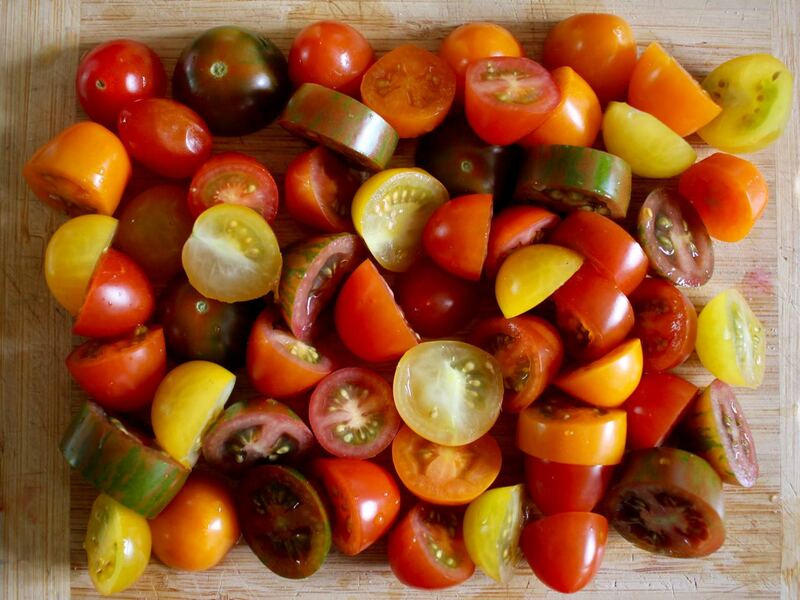 I bought a punnet of colourful tomatoes to gently fry and bake on a puff pastry tart. The tart was ok but I am not sure it did justice to these pretty tomatoes. Last week we had chilli non carne for dinner four days in a row. This is the sort of leftovers that I love. On the first night we ate it fairly plain. The next two nights we ate it with tacos and trimmings. 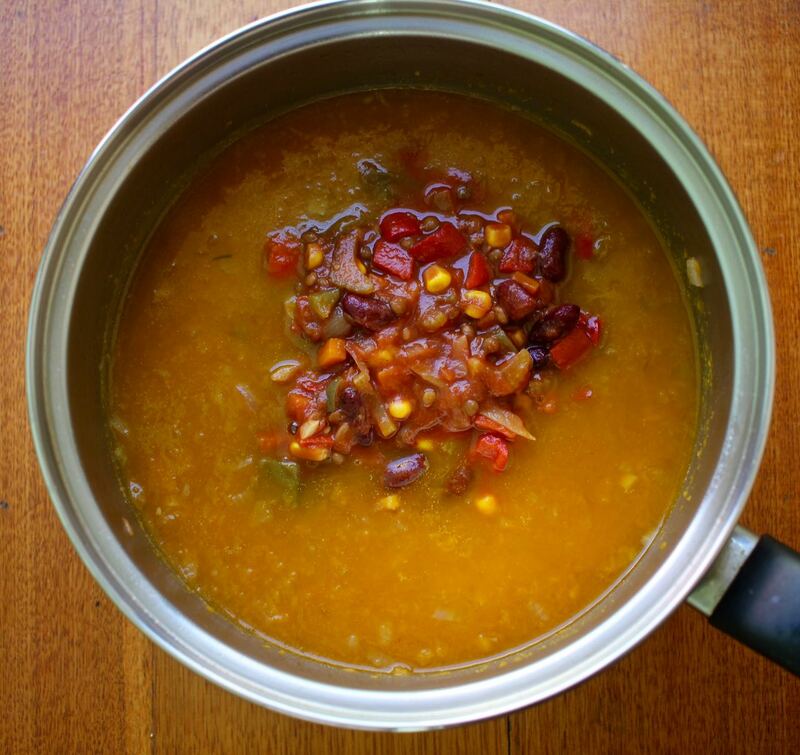 The last night I made pumpkin soup and stirred in the chilli non carne. The soup was nice but lacked some oomph. Perhaps if I had remembered to add some salsa it would have been better. 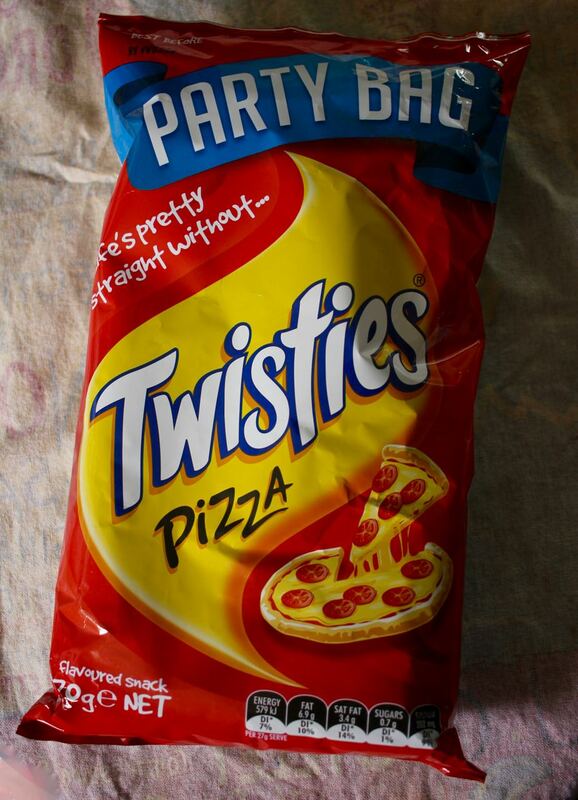 Buying these pizza Twisties was a mistake. I don't eat Twisties very often (they are like a bumpy twig of a corn chip for those who aren't familiar with this Aussie favourite) but they are a great nostalgic treat. So I decided I HAD to try the new pizza flavour. Until I tasted it and decided it wasn't quite so necessary. I prefer the cheese flavour. After all, why put cumin in pizza flavouring. Needless to say, when I then saw taco flavoured twisties soon after, I was quite able to resist. I stopped by IGA in Nicholson Street, Coburg recently. It is great to get away from the lack of choice at the two monopoly supermarkets that are closer to me. I found this Desert Pepper roasted tomato chipotle corn salsa, and some vegenaise and a jar of stuffed olives. 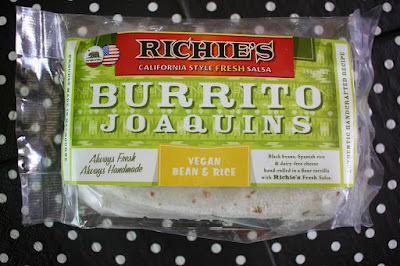 I also found this vegan beans and rice burrito at the IGA. It was lovely after being baked in the oven. The only problem was that I could not get the lid off the salsa I had bought on the same day. (It took some time another day to get the lid off.) However I really enjoyed the burrito. It could easily become a habit. 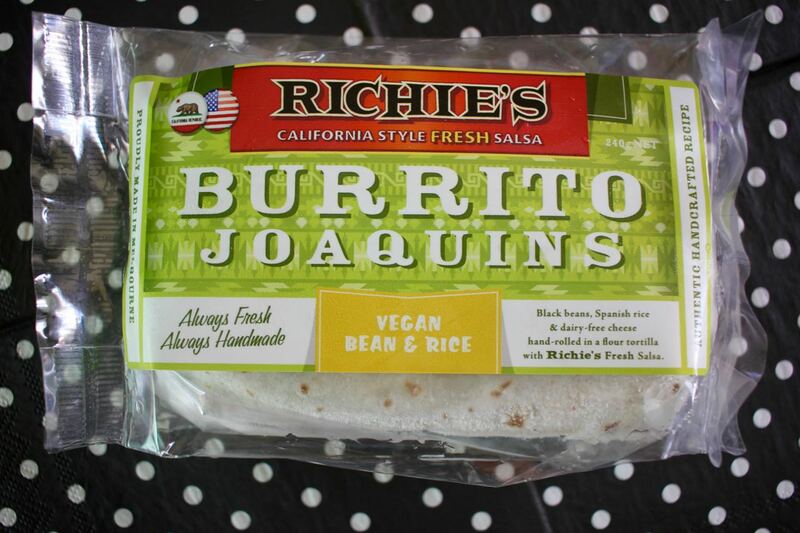 I thought that Richie's must be an American company. Then today I saw they had a stall at the Sydney Road Street Festival. Seems that they are a Melbourne company founded by a Californian. Between the patchy weather and my lack of time, I am pleased to still find time to make overnight sourdough bread, albeit less than I have in the past. While I have had a few slow rising doughs, the one in the photo went a little overboard with rapid rising. Lastly. 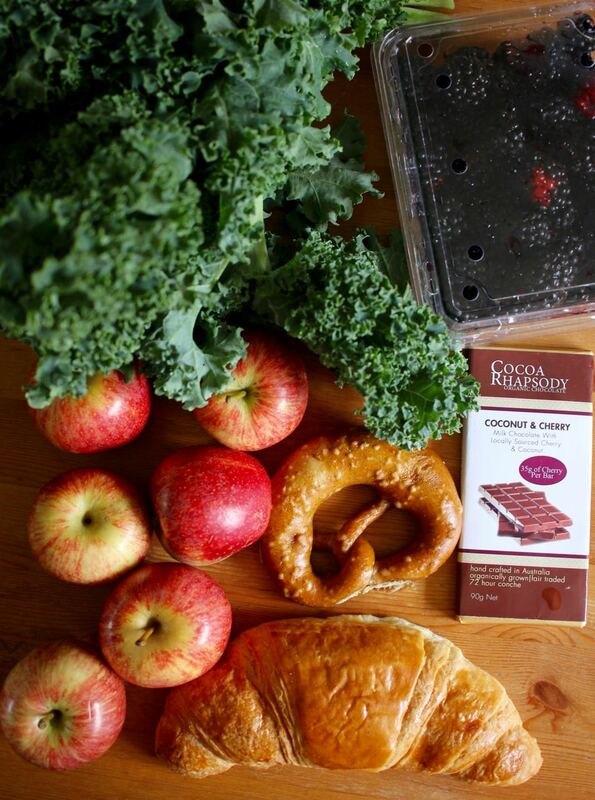 we have got along to our local farmers market for kale, apples, blackberries, pretzels, croissants and Cocoa Rhapsody's new Coconut and Cherry Chocolate. Patty from Cocoa Rhapsody was telling us that they use some of the seasonal produce from the farmers markets in their chocolates. The blackberries went into these recipes, the kale went into this salad and the apples made me excited about them coming into season. 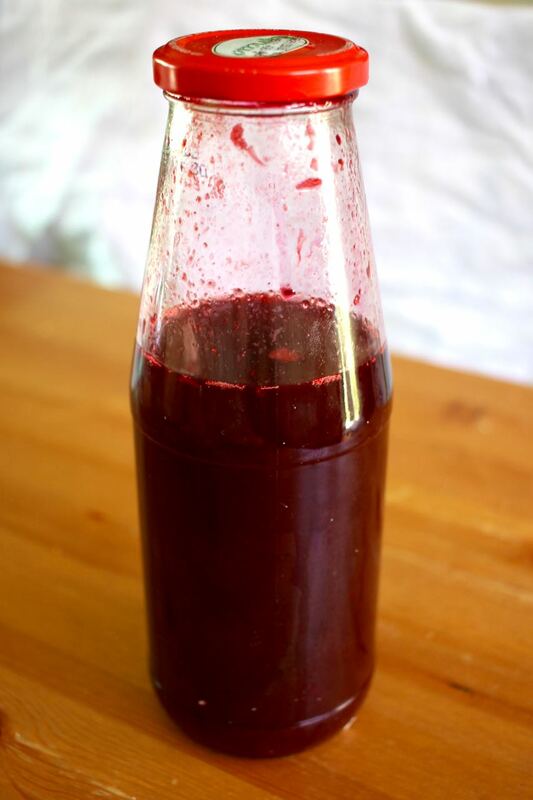 I am sending this post to Lizzy of Bizzy Lizzy's Good Things for the In My Kitchen event, that was started by Celia of Fig Jam and Lime Cordial, If you would like to join in, send your post to Lizzy by 10 March. Or just head over to her blog to peek into more kitchens. When I made chocolate blackberry cupcakes recently, I didn't read the recipe very well beforehand. 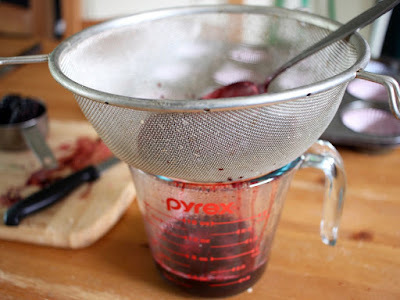 I had though I would make some blackberry syrup and use it in the cupcakes. 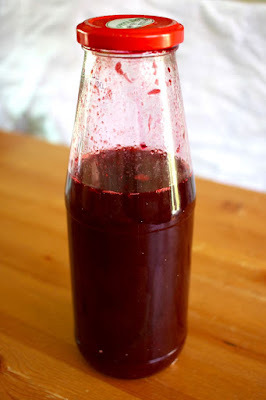 As it was, I made over 125ml and used 1 tablespoon of the syrup. There was plenty over to play with. We love making our homemade lemonade and limonade at home so I added some to a batch of limonade for a very pleasing change. Every now and again, we make this homemade lemonade or limeade to keep in the fridge for a refreshing drink. I really liked trying this different version. Some recipes I looked at had more berries in this sort of drink but I was working with what I had. Sylvia loved it and called it "berrinade"
I was really glad to use up the blackberries. We bought a large punnet of the berries from the farmers market but I haven't had much time for cooking lately. When we had a school picnic, I made cheese, onion and potato pasties because they are Sylvia's favourite but also because they are easy. You can see them in the below photo. Likewise this drink can be made really quickly. I like the idea of taking along the berrinade but it is not terribly practical nor as popular as the pasties. 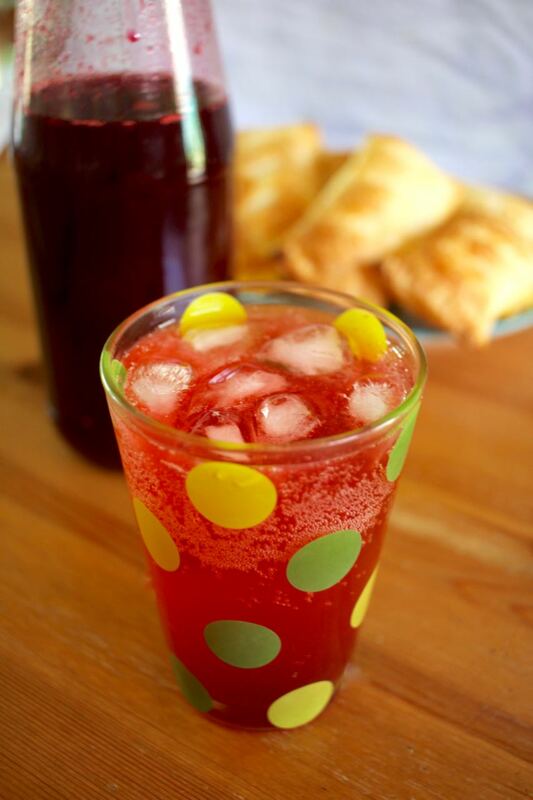 Sylvia's friends devoured the pasties but I have found some of them find our lemonade not quite sweet enough. It is perfect for us. On Tuesday this week I had a day so crazy that I was making dinner in stages between catching up with friends, a meeting at school and work. It is so nice today not to have life turned up to 11. I am really appreciating any down time. So while I stop for a breather, I will share a few random moments from school that have made me smile. I went to the first assembly of the year where the new kids in older classes were asked to introduce themselves. Everyone got a great laugh from the boy who said his name was Donald Trump. When I picked up Sylvia from school a week or so ago, the kids were all excited by a ghost called Bloody Mary. Apparently if you scratch a mirror, turn off the lights and say her name three times, the ghost would appear. All I could say was that it would be terrible if you did that by accident and summoned the ghost. This term Sylvia is doing a kitchen garden program which involves both gardening and cooking each week. She is loving it. Sylvia knows her way around the kitchen as we spend a lot of time there. She came home after the first one laughing about kids who scraped their fingers on the grater and had to be sent to the sick bay. It is constantly entertaining to have a child about. Last night when we ate tacos, she told me she had forgotten the glory of tacos. Here are a few of her recent terms that I find endearing. Heat blackberries with 1/4 cup sugar over medium heat for about 10 minutes. Strain to make about 1/2 cup blackberries syrup. (Keep the pulp for baking such as these cupcakes.) Meanwhile gently heat tap water and sugar until sugar dissolves. 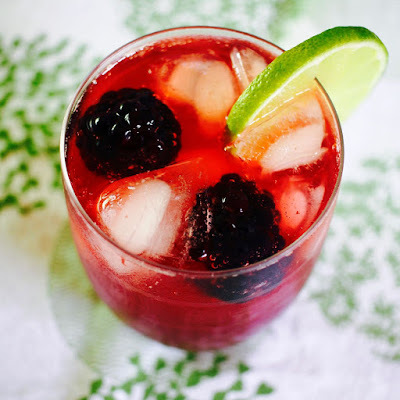 Mix blackberry syrup, sugar mixture and lime juice. To make up a glass we poured about 2 tablespoons of this mixture into a 250ml glass and filled it to near the top (ie added about 2/3 to 3/4 cup) of soda water. Of course this can be altered to taste. 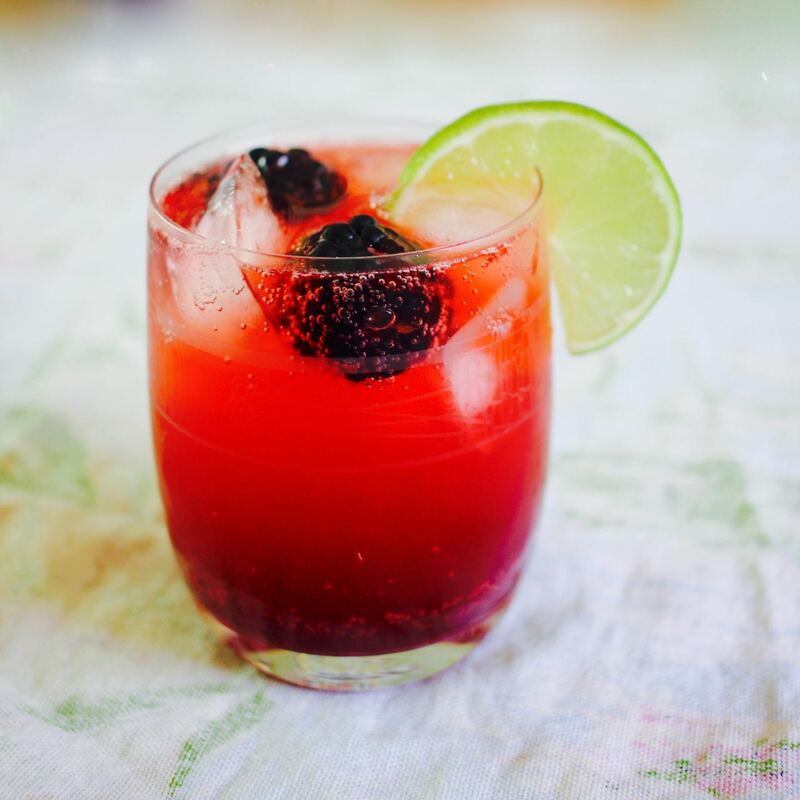 If you wanted to be fancy you can add blackberries, ice blocks and put a slice of lime on the side or a wedge in your drink. We kept ours in the fridge for about 2 weeks.